AATU is a bespoke and unique 80/20 diet that provides dogs with the true benefits supplied by Mother Nature, enriched with fruits, herbs and botanicals. 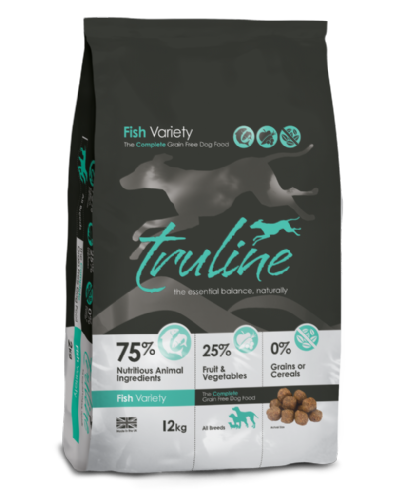 Arden Grange White Fish & Potato Sensitive Dog Food is a naturally hypo-allergenic food that is both cereal & grain free to help reduce inflammation within the gut. Autarky Turkey & Potato Dog Food is a hypoallergenic recipe that is free from grain, wheat gluten and soya, making it suitable for more sensitive dogs. 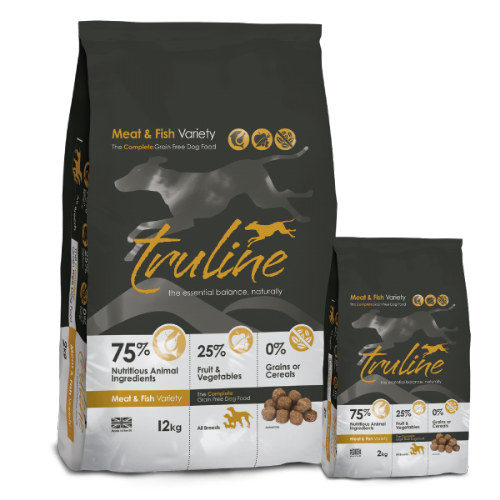 Autarky White Fish & Potato Dog Food has been designed to help keep dogs with a sensitive digestive system happy and healthy. A complete wet pet food suitable for dogs from 1 to 7 years. Natural Lifestage is a complete wet pet food for dogs, but it can be used as an accompaniment to a good quality mixer biscuit, please adjust quantities accordingly. 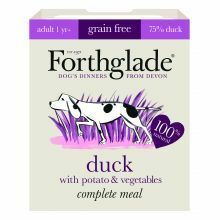 Forthglade Just Duck Grain Free is made with 100% natural & wholesome ingredients that are great for providing your dog with everything they need. Forthglade Just Turkey Grain Free is made with 100% natural & wholesome ingredients that are great for providing your dog with everything they need. Forthglade Just Chicken with Heart is made with 100% natural and wholesome ingredients that have been slow cooked to retain all of their nutritional goodness. 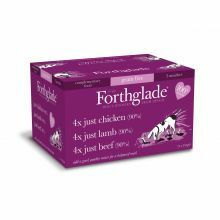 Forthglade Grain Free Adult Dog Variety features all three delicious flavours all of which are free from artificial nasties & use only the best cuts of meat to provide the dogs with the best meal possible. Forthglade Grain Free Turkey with Butternut Squash & Vegetables Senior is a uniquely sweet, tender & nutritious food designed for older dogs with a particularly sensitive digestive system. 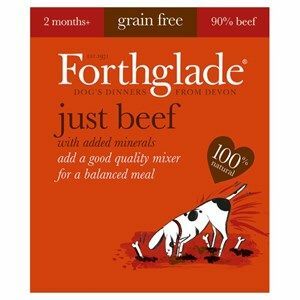 Forthglade Just Beef is a deliciously rich dinner that is suitable for dogs of all ages when mixed with a high quality mixer for a nutritionally balanced meal. Forthglade Just Chicken with Liver is made with 100% natural and wholesome ingredients that have been slow cooked to retain all of their nutritional goodness. 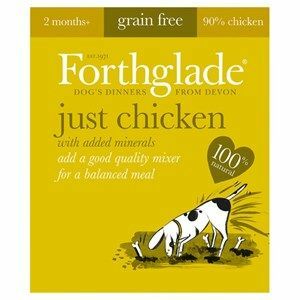 Forthglade Just Chicken is a delicious and nutritious grain free meal that can be used as a topper or fed alongside mixer to ensure your dog gets a complete diet. Natural Menu is a 100% natural, complementary wet pet food for dogs. It can be used as a tasty treat or topper as part of a balanced diet. Harringtons Grain Free Turkey & Vegetable Dog food is a complete feed that can be fed to all breeds from 8 weeks onwards. Harringtons Hypoallergenic Lamb & Brown Rice is a complete food that can be fed to all dogs from 8 weeks onwards. Harringtons Hypoallergenic Salmon & Sweet Potato is a complete food for all dogs over the age of 8 weeks. It is nutritionally complete and free from artificial colours, flavours, dairy, soya and wheat. Lily's Kitchen Beef and Potato and Vegetable Dinner for dogs. Natures Menu Country Hunter Venison with Blueberries is a complete, grain free, complete and balanced recipe suitable for all dogs. 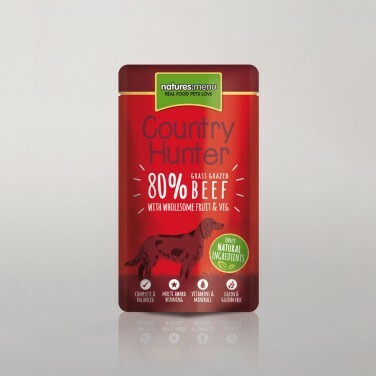 Natures Menu Country Hunter Grass Grazed Beef Dog Pouches are made with 80% grass fed beef to ensure our dog is getting nothing but the best. 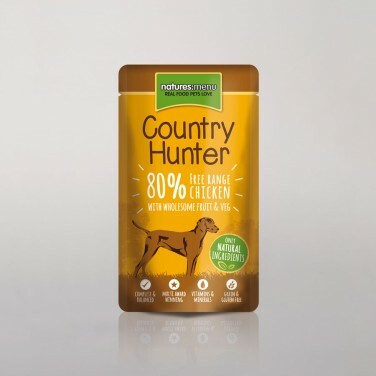 Natures Menu Country Hunter Free Range Chicken Dog Pouches are a grain & gluten free diet that has been made with 80% free range chicken. 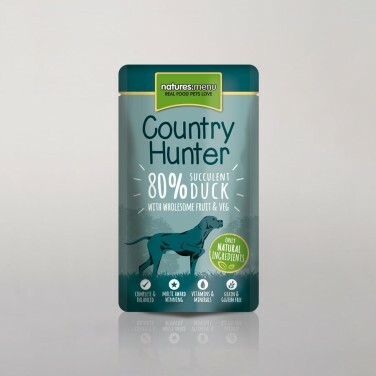 Natures Menu Country Hunter Succulent Duck Dog Pouches are filled with 80% human grade duck meat along with a selection of wholesome fruit & vegetables to provide dogs with a complete meal. 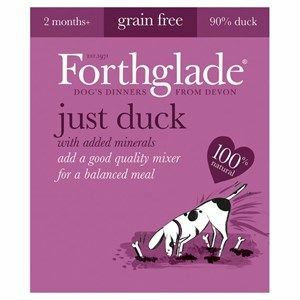 Natures Menu Country duck with plum is a complete, grain free, complete and balanced recipe suitable for all dogs. Natures Menu Country Hunter Mackerel & Chicken Dog Food Tins have been packed with delicious & nutritious raw ingredients to provide our pet with the best diet possible. Natures Menu Country Hunter Pheasant & Goose Dog Food Tins includes generous portions of super doggy food to keep your pet as healthy as possible. Natures Menu Country Hunter rabbit with cranberries is a complete, grain free, complete and balanced recipe suitable for all dogs. Natures Menu Country Hunter salmon with raspberries is a complete, grain free, complete and balanced recipe suitable for all dogs. Natures Menu Country Hunter Turkey Dog Food Tins are packed with premium quality meats blended with a selection of wholesome fruits and nutritious vegetables. Pero Super Sensitive Grain Free, Ocean Fish and Tapioca has been enjoyed by German Shepherds over the past few years. .
Pero’s Grain Free Pork and Sweet Potato with Apple recipe is a complete balanced grain free pet food made up of over 40% farmed raised pork meat and includes highly digestible sweet potato as its primary carbohydrate. Pero’s Grain Free Turkey and Sweet Potato with Cranberry recipe is a complete balanced pet food made up of over 40% farmed raised turkey meat and includes highly digestible sweet potato as its primary carbohydrate. Pero’s Grain Free Puppy and Junior recipe is a complete balanced pet food made up of over 50% wild ocean fish meat as a single source protein. Sneyds Wonderdog Elite Gourmet Fish & Potato excludes: Beef and Pork in any form as well as Dairy, Soya, Eggs, Wheat and Wheat Gluten, artificial flavourings and colourings. Perfectly balanced complete food for dogs, made with 40% freshly prepared British venison. Grain free. Gluten free. Hypo allergenic. Ideal for dogs with food intolerances. Vitalin Adult is a highly nutritious complete balanced food in a small kibble for all adult dogs and does not require any additional meat or supplements. Vitalin Duck & Potato Large Breed Dog Food is a carefully formulated and nutritionally complete food that is suitable for large breed dogs that live a happy, healthy lifestyle.